It's January and if you've followed my blog for a few of the years I've been up and running (I've been here since '06!) you may have noticed that I like to reorganise like crazy. It's almost a second hobby for me. My house is very small (700sqft) and we have a LOT crammed into here so to be able to control something, *anything* here, is big for me. I like to photograph my space, I want to make a new video, and I want my space to be *organised* for that. Something that has been bugging me in my space is my stamp organisation. We built this shelf *for* me, but the top shelf is a bit too high. And the stamps at the top get overlooked. In my ongoing mission to use my products I want to make sure that all my stamps get used at least once. This kind of means reorganisation. This is what I'm dealing with now. That big hole in the middle of the bottom shelf... those stamps are in the next picture. They'd already been removed and I didn't feel like replacing for staging purposes. 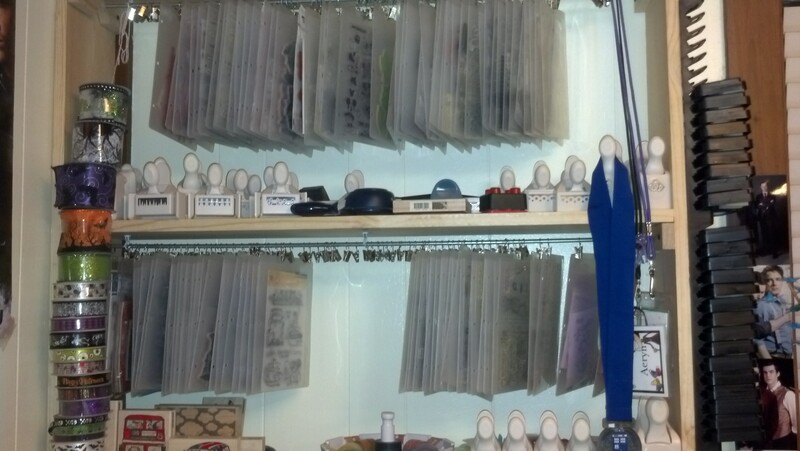 Point is, I use Tim Holtz Unmounted Stamp Envelopes to hold all of my stamps and I hang them on a rod underneath these shelves using Clip it Up clips. I really like being able to see things, but standing there to flip through my things is becoming problematic. I want to change it up. I explained it okay here on the picture, but the idea is that I'm going to do a bunch of themes instead of by manu and just kind of sliding in the clear sets with their own backings. I'm using Fellows Crystals Binding Covers, cutting them down, and sticking the stamps onto them before sliding them into the envelopes. I'm going to need to buy some cute bins to put these things in. Something maybe purple, or aqua. Here I am in progress. I separated out all of my Xmas stamps and then got to work separating the sets. 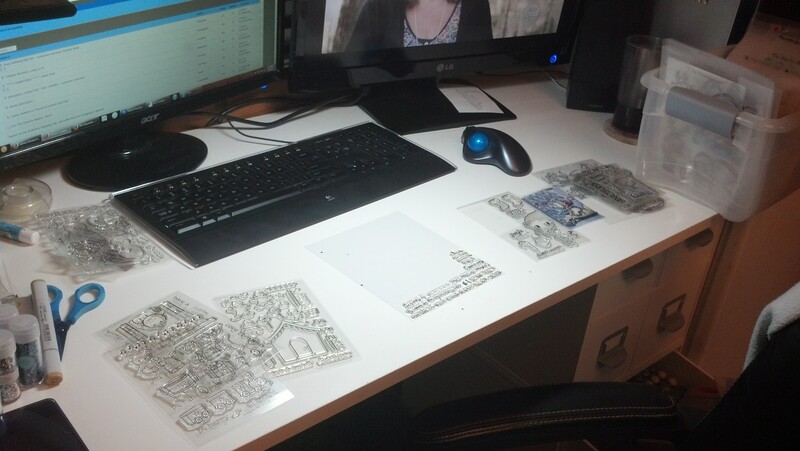 Right now it looks like I was in progress of taking all the sentiments out of the sets. I decided that "Xmas" and "winter" were two different things, but I also realised I didn't have enough sentiments of either to fill up an envelope. I let those "mingle". But within Xmas I have envelopes of critters, people, and elements. I've now finished with Christmas, but I have winter (and everything else) to go through. 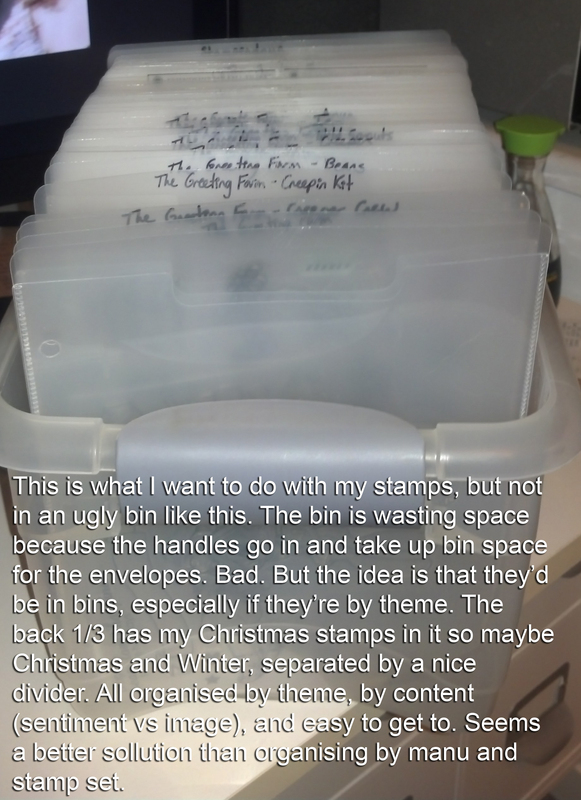 On the right you see the pile (a portion of it) of winter stamps that I have left to go through. They're several manus all mixed together because that's really what I'm after with this idea. The plastics have the sentiments printed on them and whatnot, but the sentiments have already been removed and put in the envelope all the way on the left. That's *all* just Christmas and winter themed sayings. In the middle left you see the "elements" envelope I made up of things like hats, scarves, presents, small trees and the like. And in the middle right you can see an envelope of images. Little critters mostly. The people have their own envelope. Rubber and clear are mixed in together as I don't care, I'm just going for space saving here. Having completed a section (I think... pretty much) I've found that doing things this way is saving space. I haven't thrown away those plastics printed with the images, right now they're on the bottom of the bin. 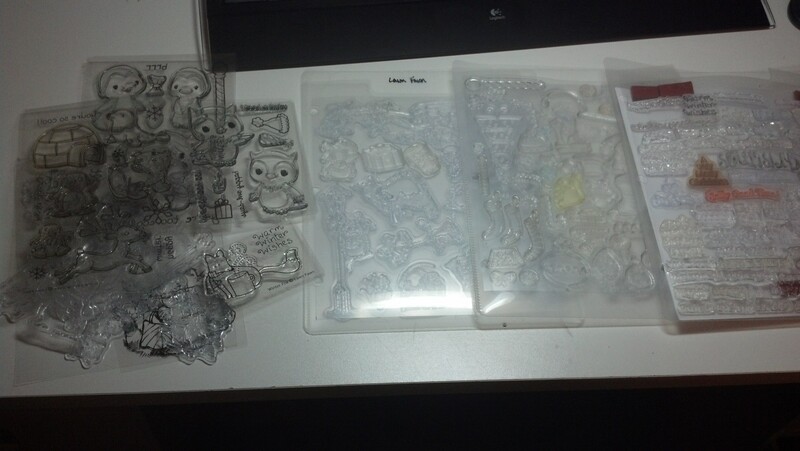 Worse comes to worse I can look through these plastics and pick out the images I want to use before going to get them. I'm not really worried about the visual, being able to see things clearly on the clear stamp, so I'm not going to make stamped versions of the images, or worry about cutting up the plastics and matching them. That's extra work I'm not interested in when I could be creating. I have SO much to do, I don't need to make more work for myself when I'm trying to create more efficiency. That's all I have for you for now. I'll try to update as something big happens, like if I manage to get the bins or if I finish more than one small section of my stamps. Hopefully this helped you guys a bit if you're in an organising mood in January! Thank you so much. I love seeing all your different organization ideas. Especially since you are looking to save space and be efficient.